I’ve been noticing a trend with my races lately–the less I stress and the less pressure I put on myself has proven to be the best race strategy. 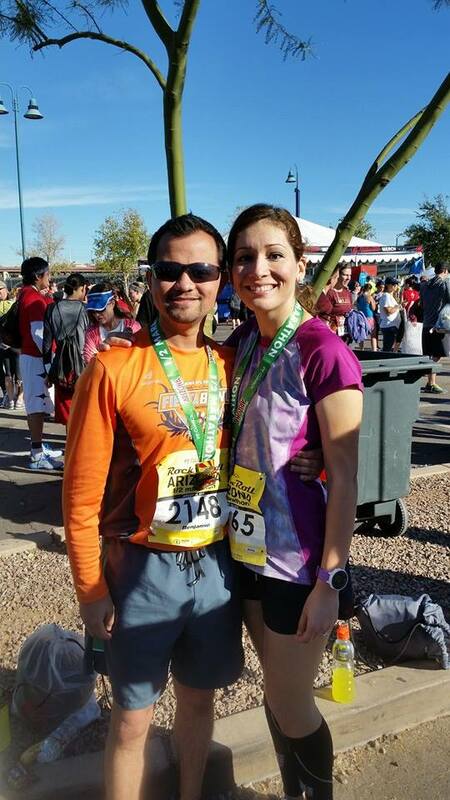 I went into the Fiesta Bowl 1/2 Marathon last month not sure what I wanted to do and ended the race with a killer PR of 1:55:37 (beating my previous by almost 3 full minutes). On Sunday, I was debating about treating this like a legit training run or going for another sub 2 (but not at all thinking about a PR). The meet up was so much fun! There were a bunch of giveaways and the grand prize was a free race entry from a local racing company, StartLine Racing. Guess who won? MEEEEE!!!!! 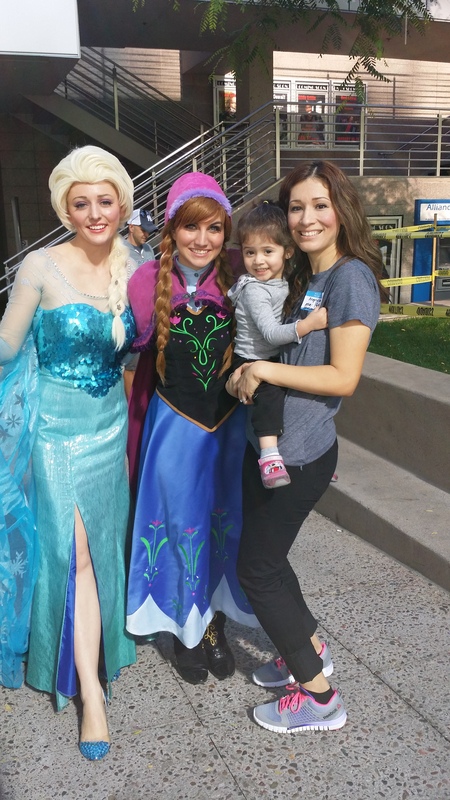 My daughter had had a blast at the social, even getting to meet Elsa and Anna! and then we had lunch downtown. It was such a beautiful, relaxed Saturday. I carried that momentum to the next morning as I got ready. We arrived to the race early and well prepared. Prepared as in I was not cold. I know, I know, I’m in Arizona but cold for us lol! It was actually supposed to be a gorgeous day–and it was–but the morning was a bit chilly (41 degrees is COLD! lol!). I had on sweats and a sweater and was very comfortable up to the start. We gear checked our stuff and then made our way to our corrals. I met up with with one of my running buddies and wished him luck. Along the way, I ran into another friend from my running club, Harry, who is super fast (he’s attempting a BQ time at Phoenix). I asked him what his goal time was and he said that he was just going have fun with this one and was going to help a friend pace. Their time was around what I had thought I’d like to be, 9 minute miles. I figured I’d hang out with them and see where it took me. My husband wished me luck and he moved up to his corral. The gun went off and we were on our way! We started off at a very good pace and I felt it was smart that I had decided to start easy and relaxed. The first mile ticked off 8:51 and I thought, this is good. So far, so good. I could feel myself start to pick up the pace a little but still felt good and mile two went by at 8:47. It was here that Harry and I somehow lost our other friend. She had made a pit stop at the first water station unexpectedly and we couldn’t find her. Harry even went back to look and met up with me later when he couldn’t find her. We continued on our way and stayed consistently near 9:00 up to mile 9. Mile 7 was a Gu stop and Mile 9 was a killer hill. 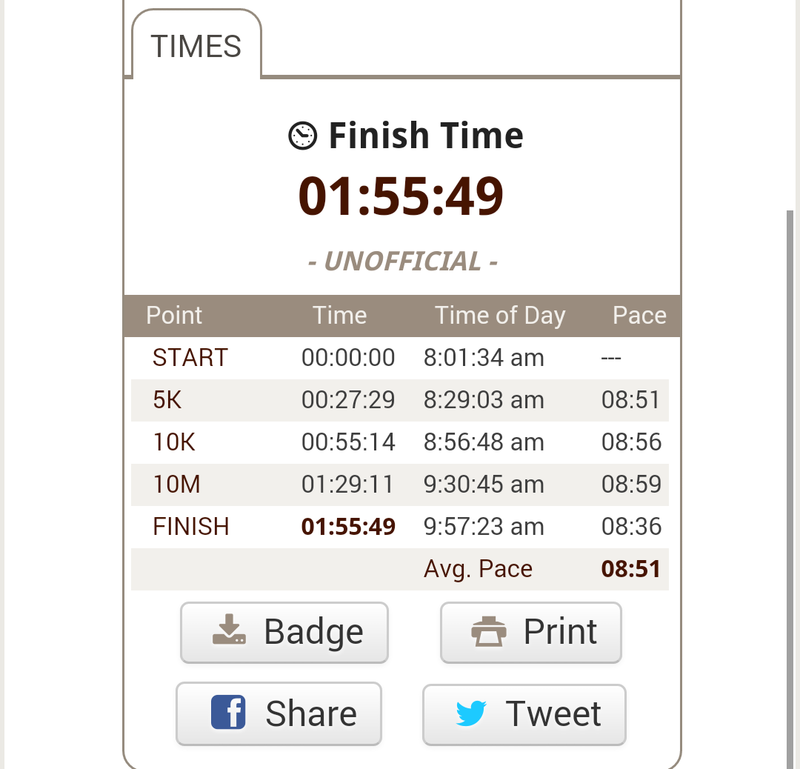 I was very pleased with mile 9. The entire first 3/4 of the race is an incline that culminates with a huge hill at mile 9. This is usually where I bonk (last year miles 8 and 9 were 9:26 and 9:22) so when I saw 9:09 I was so happy! It had felt like a 20 minute mile lol! Seeing how well I had done up to that point motivated me to continue. I ran the last 4 miles strong and the last mile with all heart. 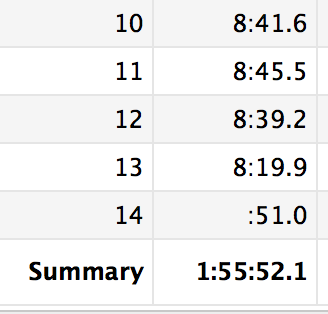 I had done the math, I was going to kill last year’s time (1:58:11)! This fact made me so incredibly happy; I had no idea that I was actually going to be close to a PR. Had I known, maybe I would have pushed it but because I was so thrilled with how I was doing up to that point, I wasn’t at all thinking about even being close to PRing. As each mile clicked away, I became more and more elated! There was no plan, no strategy, I just started out with what felt good and carried my momentum the rest of the way trying my best to stay consistent. This was a race that was by no means easy; I felt like I was working the entire way. But, I wasn’t dying at the end (my race pictures show otherwise lol!) or felt like I had overworked my body. I just felt really good. –Do you always have a race/game plan/strategy? –How would you describe yourself (or the way you feel) at the end of a race? I agree in not having specific goals for a distance you’ve never ran. That’s so awesome! I’ve found in both running and other endeavors that the more pressure you put on yourself, the harder it can be to perform well. I always psych myself out. But if I got into it with lower expectations, I usually end up doing better. totally agree. I think it’s great to have goals but it’s also important to keep in mind things happen and not meeting a goal isn’t the end of the world or a failure. 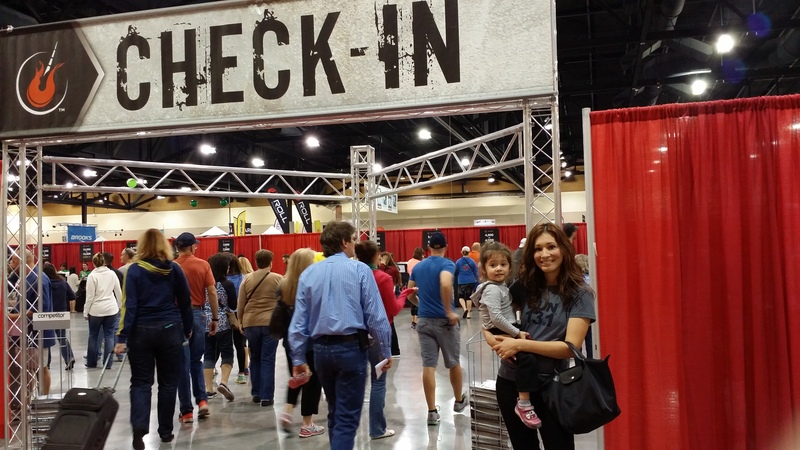 Last year, I actively trained for this race hoping to get a sub 2. I was on a mission. I got it (yay!) but it wasn’t as “fun” as this year when I didnt’ have a specific goal. I also think it’s because I already had that sub 2 that let me enjoy it more? Definitely! Even if I train with a goal in mind, I try very hard to go in relaxed. I’ve seen firsthand what happens when you go into a race with a very specific goal–not getting it totally takes away from the entire experience because all you’re focused on is the “missed goal”. No bueno. 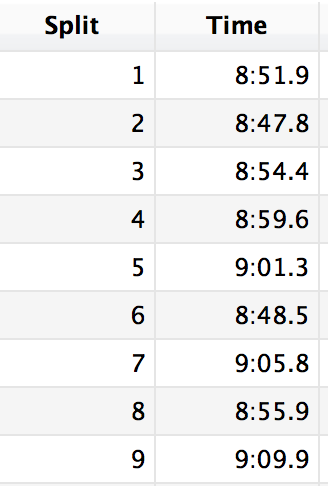 I’m always amazed when I can run a certain time on a tough course. Well done Helly and Mr. Helly as well 🙂 My girls would have loved to have seen Elsa and Anna. Jajaja!! I know–I’m so spoiled living in Arizona. But seriously, we were all freezing lol! 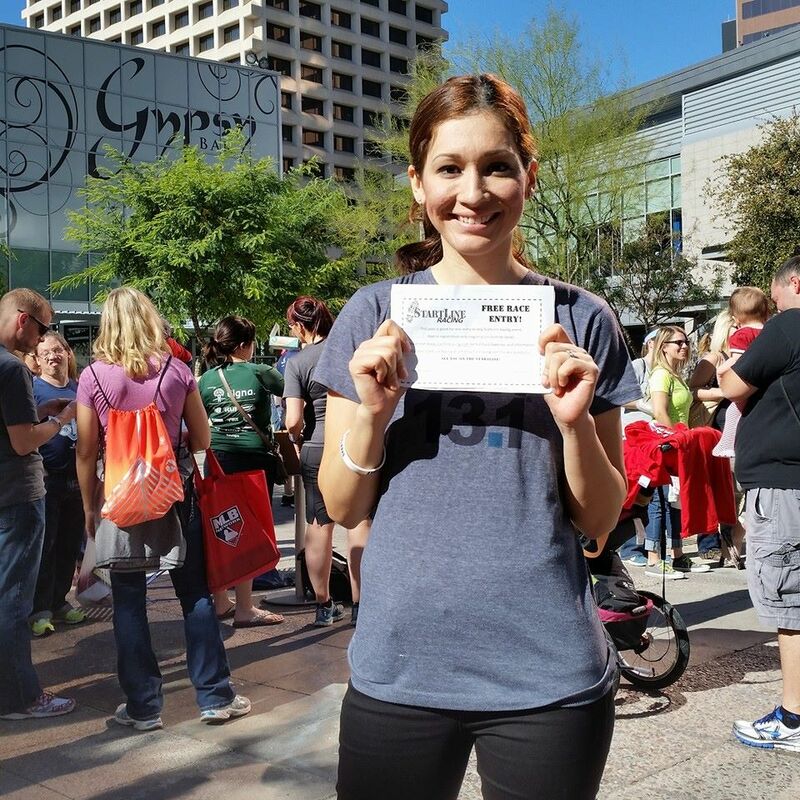 Awesome job – especially at Mile 9! I’m sure this race was a huge confidence booster. To do so well on a tough course. Imagine how you will fly on a flat one. And congrats to your hubby too. Your daughter is super precious. Awesome job!!! Congrats to both you and your hubby! That does look like a tough course. I always have a race strategy in mind – whether it be enjoying the ride or really gunning for a new PR. I usually adjust my strategy depending on the course and weather too. However, like all things in life, a race doesn’t always go how you plan anyway so once I start and am running along, I usually reassess how I’m feeling at some point and alter my expectations if need be. If I look at it that way, then I always have some sort of “strategy” even if my intent is to see how it goes 🙂 I totally, completely agree with your thoughts on adjusting and reassessing expectations if things aren’t going as planned/hoped, or even vice versa, if I’m feeling good then maybe I’ll push myself a little harder. Yay! You are on such a roll Helly! So so proud of you! 🙂 To be that close to your PR on a much tougher course just shows how strong you really are! As for race plans, I need some idea of how I want things to go, but when the going gets tough I try to throw out the plan and just stay in the moment I can control or else I get too overwhelmed thinking of the outcome. It’s nice to know the layout of the P.F. 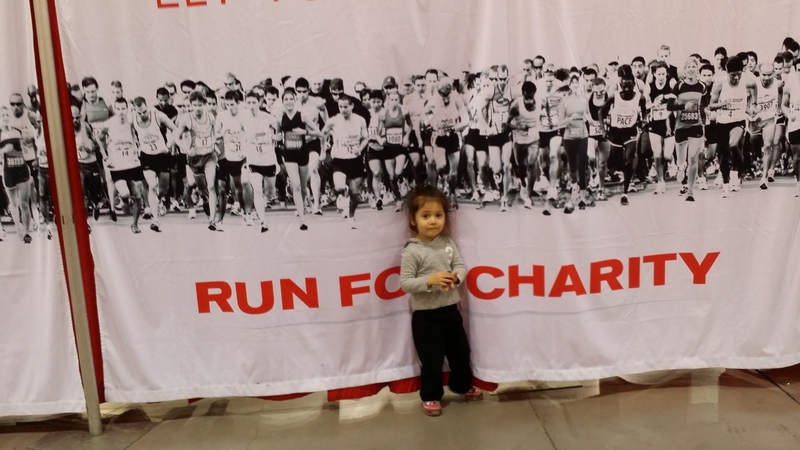 Changs half too! I had no idea what the course was like until I saw your elevation profile. It’s a tough course imo! I so hope we can run the same race soon! Girl, you are killing these races! Great job!! I don’t usually have a plan…eh, who am I kidding, I usually have a time in my head that I would like to meet, but take it as it comes during the run! I'm also jealous of your celebrity sighting. Betty would have flipped! L was in shock! lol! I’m sooo jealous of your splits! Congrats on another great race! Congratulations, that’s awesome! Those are amazing splits! Congrats lady, you did so awesome and your splits were incredible! As always I love the pics of you, B and L! Great job!!! Such consistent splits! This is awesome, congrats! Great job Helly (and Mr Helly)! 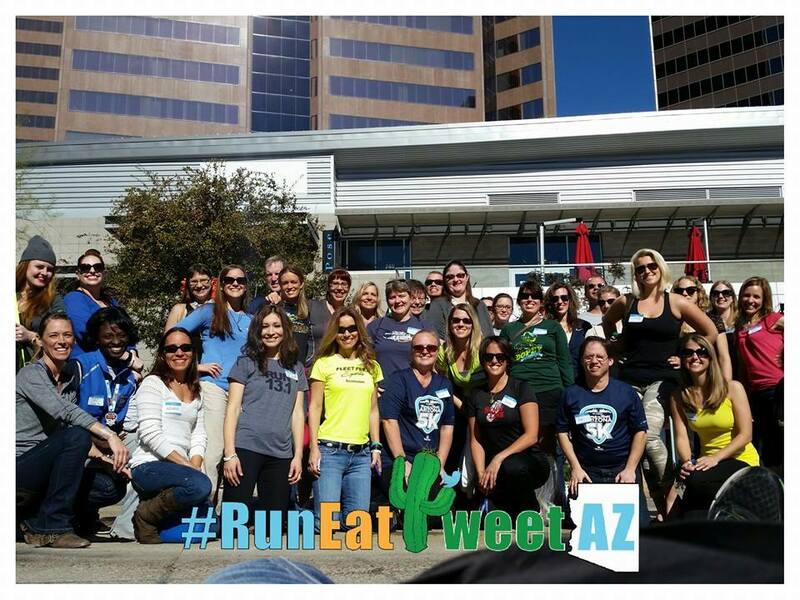 You are rocking that marathon training and relaxed racing! 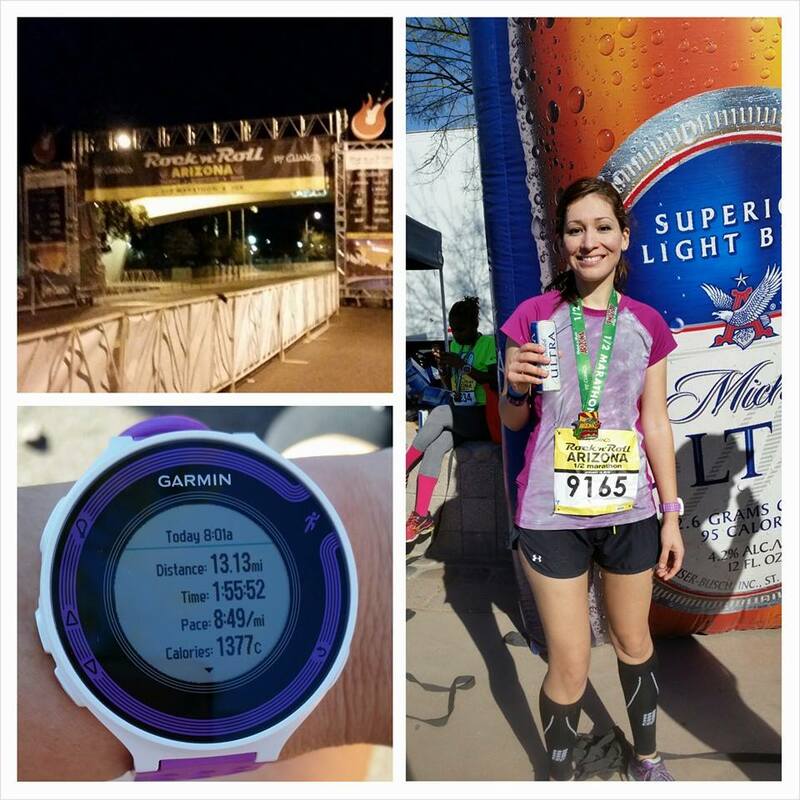 The half marathon that I enjoyed most (and raced best) was my third race. I was coming back from injury and put no pressure on myself for time and it ended up being the most consistent and strongest (but not quite a PR) race that I’ve done. Isn’t it funny (and cool!) how that works! ?